I was deeply saddened by the news of Ralph Kiners passing yesterday. It had me thinking, here I am a 27-year-old Mets fan, yet I was emotionally struck by the death of a man who I had spent little time watching and listening to on TV. That speaks volumes to Kiner’s ability to leave a lasting memory on any Mets fan who was blessed to watch him in the broadcast booth. Kiner was the last living member of the original Mets broadcasting crew, consisting of Lindsey Nelson, Bob Murphy and himself. The three of them stayed together from the Mets inaugural season in 1962 to the 1978 season. At that point Nelson moved on to other endeavors, Murphy went on to take control of the Mets Radio play-by-play duties and Kiner continued to be a stable on the television broadcast through this past season. My earliest memories watching the Mets in the early-to-mid 90’s consisted of watching the Mets on channel 9 and Fox Sports, until the arrival of SNY. No matter the channel, Kiner would be calling games with the likes of Tim McCarver, Tom Seaver, Gary Thorne and Fran Healy. I would sit down with my Kahn’s hot dogs (Because they were the team sponsor at the time) sit back and enjoy the games. But the Mets weren’t exactly the greatest team in the world in those years, or for much of this team’s existence for that matter. The stories that Ralph Kiner shared would bring me back the next day as much as my love for the team did. When you look back on Kiner’s life, it reads something similar to the script of Forest Gump. When you put together all of the historical events he lived through and people he dealt with over the years, it’s simply amazing. We are talking about a man who was a part of “The Greatest Generation”, a group that is quickly disappearing, this generation has lived through some of the most extraordinary years in American history. Kiner spent his childhood through The Great Depression, he grew up going to ball games and watching, yes physically watching, Babe Ruth and talked baseball with Ty Cobb. While in high school, he hit a homerun off of Satchel Paige in a pickup game. After the attack on Pearl Harbor, Kiner quickly joined the Navy, where he served as a pilot throughout WWII. Upon his return, Kiner went on to become one baseball’s greatest power hitters. He put together a Hall of Fame career, playing in the same era as Ted Williams, Bob Feller and stepped into the batter’s box opposite Warren Spahn. His social group consisted of hanging out with Bing Crosby, Bob Hope and Frank Sinatra. He even took Elizabeth Taylor out on a date! I mean, WOW. Now it has been quite some time since Kiner has been a regular calling games. The last several years he has made appearances, mostly during day games, joining Gary Cohen, Keith Hernandez and Ron Darling in the booth for a few innings. His speech had been slowed due to a stroke he suffered, but we were all more than willing to be patient with him in anticipation of hearing one more story. The way Gary, Keith and Ron treated him showed you just how much respect this man earned when he walked into a room. The 3 of them would turn their seats and face Ralph, waiting on his every word, you could see the smile on their faces just to be talking baseball with this all-time great. These 3 are arguably the best broadcasting team in the game today and yet if it were up to them, they would sit there and listen to Ralph all day. 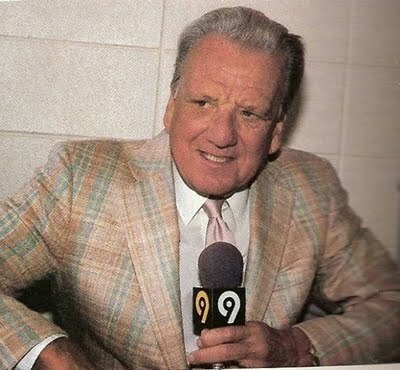 Simply put, Ralph Kiner got the most out of his 91 years of life. You will be missed Ralph, I will be forever grateful that I was able to listen to you call a ball game and share some of the most fascinating stories that I will ever hear.